Published April 14, 2014 at 1000 × 698 in What is Ukraine? 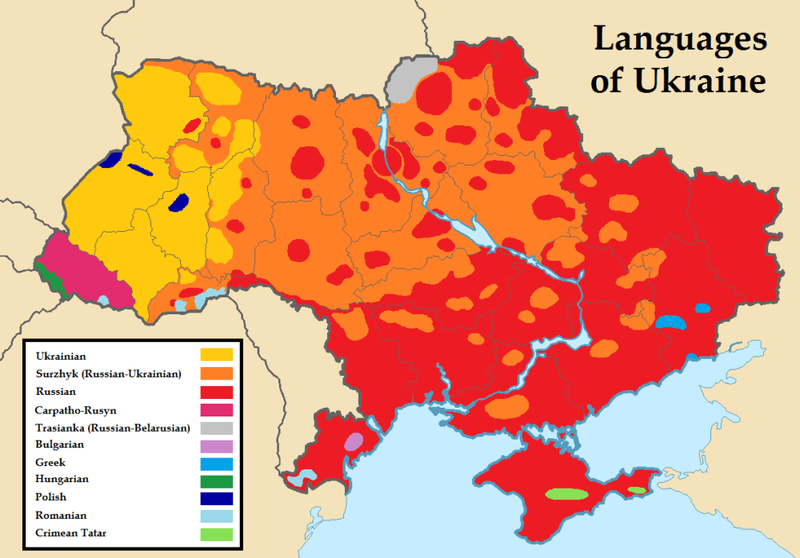 Linguistic Map of Ukraine, utilizing 2009 information from the Kiev National Linguistic University and data from the 2001 Ukrainian Census. Note that Ukrainian is highlighted in yellow. The mixed Russian-Ukrainian language Surzhyk is in orange. Russian is in red. Carpathian Ruthenian (spoken in Zakarpattia) is in the red-violet color. The Bulgarian, Greek, Hungarian, Polish, Romanian, Crimean Tatar, and Trasianka (Belarusian) minorities are also highlighted.